In the second last of its UK tour dates, Jeeves and Wooster brings its West End show to Glasgow. Welcome to upper class1930s England, as Bertie Wooster enlists the help of his butler Jeeves to stage a play of antics and misdemeanours. Jeeves (John Gordon Sinclair) and Wooster (Joel Sams) are entertaining in their contrast, one that is expertly played with for for comic value. 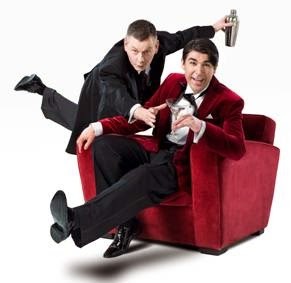 Jeeves saves the latter from his social ineptitude; he is rich and intelligent, but breezes through life blissfully unaware (he takes a bubble bath mid-show), whilst Jeeves cleans up his messes and ensures his respectability. As leads they are both excellent, and Sinclair’s ability to chop between characters (at one point he is dressed half male half female, to great audience appreciation) is remarkable. Butler Seppings (Robert Goodale) is the only additional actor in a play that becomes one of fast-paced rotation through costumes and set. This idea of a ‘play within a play’ allows much of the humour to derive from the audience witnessing prop erecting and costume changes on stage. Indeed Jeeves, when needing to present a female character, tears down a curtain and places a lampshade on his head to do so. Throwing a stolen policeman’s hat into the crowd to prevent its discovery on stage also only works to their advantage. From there, the humour is inclusive, playful and very effective. The names and characters and places of the plot merge into one frenetic ball - something to do with a weekend at a country house and the stealing of a silver cow creamer.However, it is spirited, energetic and oh-so-jolly enjoyable, as long as you absorb yourself in the mind-set of laughing at and not with. The audience had no qualms about this, with slapstick humour that erred just on the right side of sophisticated to secure their approval. Even in moments where it was a little too physical in its comedy, it wasn’t cringe-worthy but perhaps deliberately mocking. Wooster’s intelligence is diminished by the power of his extraordinary butler; when things go awry, Jeeves saves the day. The duo and their sidekick Seppings are a delightfully entertaining trio, ending the play with a 30s dance routine that secured its feel good factor. Even if this would not be your traditional cup of tea, I would recommend you see it as a humorous delve into the pompous life of upper class 1930s England. Old chap.